The Afterlife of Holly Chase by Cynthia Hand was definitely a book that I was looking forward to reading this year, not only because I really love Cynthia Hand, but also because it’s a holiday book, and there are just not enough holiday books in my life. I’m a little late getting my thoughts up for the book, but I finally finished it, and it was a really great read! The Afterlife of Holly Chase is a take on A Christmas Carol by Charles Dickens, a story that most people are familiar with. Holly, once a Scrooge herself who did not manage to turn her life around in time, is spending her afterlife working as The Ghost of Christmas Past for Project Scrooge, a top-secret company that picks a new Scrooge every year to try to save. Being stuck in the afterlife, frozen as a teenager for the past few years, is not really all it’s cracked up to be. But this year is different, and things are definitely starting to change for Holly and Project Scrooge. There were a lot of interesting characters to follow in the story, including the main character, Holly. I can definitely see why she was chosen as a Scrooge in the beginning of the story; she definitely wasn’t a nice person. But I enjoyed watching her grow throughout the story. I really enjoyed the workers at Project Scrooge as well, including Stephanie the Intern, who was probably my favorite character in the whole story. There are a lot of people to like in the story! As I mentioned above, there just aren’t a lot of holiday books in YA, and I’m thrilled to have had a new one to read this year. (They definitely help to get you in the holiday spirit!) I love the references and similarities from A Christmas Carol, and I now feel the need to read the original story as well. I’m definitely going to try to make time to read more holiday books this season! It’s the perfect time of year for them! 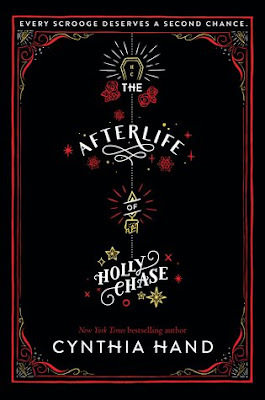 Overall; I really enjoyed reading The Afterlife of Holly Chase by Cynthia Hand! It’s the perfect book to have on your holiday reading list this year, and it will definitely put you in the holiday spirit. I will definitely have to re-read this book again next year as well! Check it out!